Keep your eyes open. Look around, my friends. The live music experience is teaming with sacred and serendipitous moments lurking around every corner. 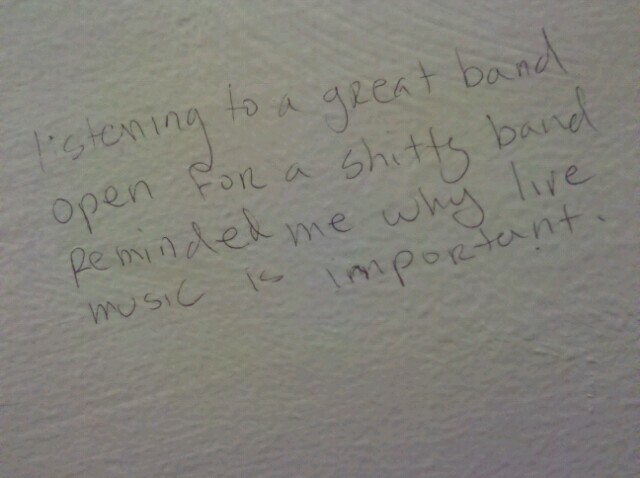 And you never know what you’re going to stumble upon or find written on the bathroom walls at concert venues. It just might change your life. It did during our trip to the Abbey Pub in Chicago. Remember the last time you read a message a fan left on the wall in the bathroom at a concert venue? Did it make you laugh? Did it influence your concert experience? Did reading it make you feel that the fan wrote the message just so you would discover it weeks, months or even years later? 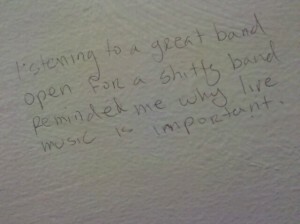 I’ve wondered all those things about the messages I’ve seen written on walls and stall doors at concert venues. One of the reasons is because they keep me entertained when I can’t read my mobile phone or talk to the guy at the stall next to me for obvious reasons. The other reason I love to read the messages that concert fans leave on walls is because the messages are perfectly preserved artifacts that capture the our emotional experience at the show. And the messages are both archaeological and anthropological in the most personal and universal way. Because the messages tell so much about that person and that moment. And the messages connect us just like concert genealogy does. And we usually can relate with what they wrote and so it instantly puts a smile on our face. Whether the message is profane, profound or so personal I have no way of knowing the emotional context to understand, I still get a kick out of reading the message. And I love wondering about the person who wrote it. The bathroom messages that I love the most are the ones that capture the most holy of moments when we feel so inspired that we decide to shun public taboo and buck the social rules and let our muse have its way and write on the walls, letting the unhindered spirit of live music expression take full control. But I’ve had some of my most creative thoughts when I’m in the bathroom sitting on the can. And I think the same goes for the concert fan who gets inspired to express themselves freely while relaxing on the almighty porcelain throne of creative inspiration, too. Again, there’s nothing more sacred than enjoying a nice quite moment to ourselves in the bathroom of our favorite concert venue while we hear the muffled rumble of the music just beyond the bathroom walls. As I’ve been to music venues around Chicago, I’ve seen probably hundreds of funny messages and strange sayings scrawled on the walls with ink, lead and sometimes even blood or other bodily fluids, which makes me think the message write we write is just as important as what we use to write our message with. But seriously, some of the messages I’ve read have influenced or even become part of my concert reviews. Hey, sometimes a show is so bad, or you’re looking and struggling for an angle for the review, that you’ll use anything that works. That said, I say THANK YOU to all who’ve taken the time to write down your thoughts in one of the most sacred places on earth: the concert venue bathroom. What Did Colleen Find At the Abbey Pub? As a member of the male population, my bathroom sacred message discoveries are somewhat limited because I’ve never seen what’s written on the walls and stalls in the ladies bathroom. But during this Beats Antique show at the Abbey Pub while I was chatting with this fan, something beautiful was discovered. While Colleen was taking a well-earned bathroom break from her photo duties, she looked up at the back of the stall door in front of her and discovered the note (see photo above) written on the door by a fellow fan. Colleen snapped a photo of it and showed it to me later that night. And now I’m sharing it with you. I’m really excited to see what other type of sacred messages we can discover and share with you as we continue our exploration. And I invite you to keep an eye out for any other favorite sayings you see on the walls in the bathrooms of your favorite music venues. You can post a link to the images below or post them to the Live Fix Facebook page and drop a quick note telling us where and when you saw it.